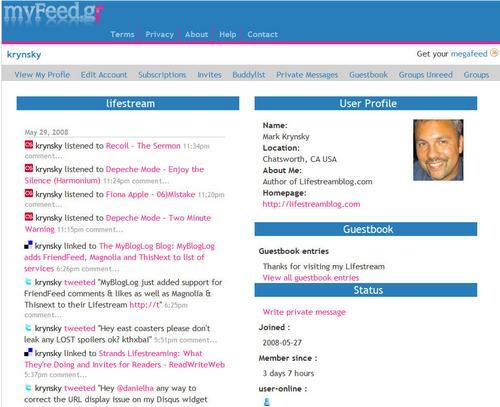 My friend, and creator of Life2front.com Lifestreaming service, Olivier Duprez notified me of new Lifestreaming service myFeed.gr. The site is based in Greece and was created by 2 guys known as Skull & Basilis according to the about page. The site appears to be using a large amount of the core Drupal codebase but these guys have definitely put a good deal of effort into some customizations. Overall I’m pretty impressed with what they have been able to accomplish with Drupal. The flexibility of the platform never ceases to amaze me. myFeed.gr offers support for 35 services already with the ability to add your own feeds. They also have support for placing users in groups, exporting your Lifestream in an RSS feed, and widget support. While the site is pretty functional there are still some rough edges that need to be smoothed out. I came across some errors, some of the navigation can be cumbersome, and there is no simple way toÂ find other users on the site. So it’s not really yet ready for prime time,Â but I have to applaud their effort and they are a definitely a service to keep your eye on. thank you for reviewing myFeed.gr. We are doing our best to make useful this site.